“On Comit on Cupid on Donner on Blitzin!” Away went the little Reindeer treat bags to my sons preschool class. 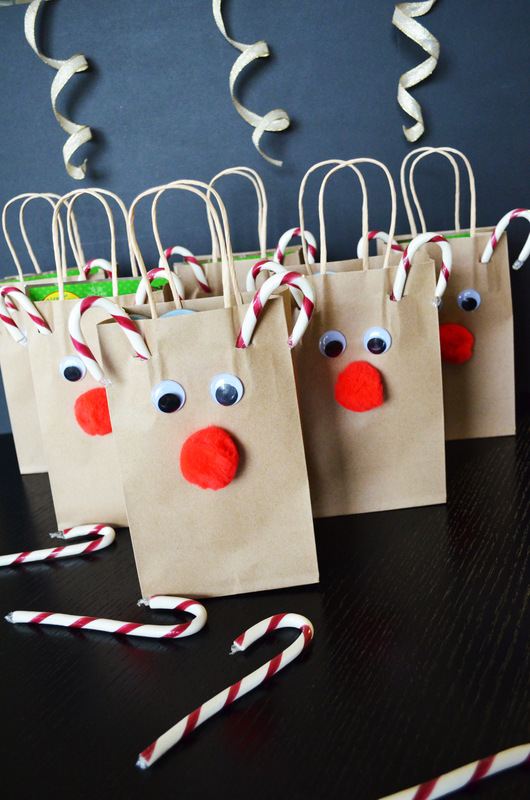 Pretty sure they are the most adorable Holiday treat bags that ever existed and oh what fun it is to make. I could not stop staring at them on my dining room table the days before taking them into his classroom. I wish I could of have posted this idea earlier in the month, but it’s not too late for you to make these gift bags that I’m most certain even adults would be just tickled to receive. They are very simple to make and I’ll share with you a few tips that I have. Thank you Whole Foods Market for carrying organic candy canes(via Tru Joy sweets), they are very tasty! I filled the treat bags with a Disney Frozen book from the dollar section at Target, a mini coloring book, stickers, crayons and organic suckers(via Yum Earth Organics).